When you are buying or selling property in today’s real estate market, it’s important to have confidence in your real estate professional. My commitment as your local realtor is to provide you with the specialized real estate service you deserve. When you are an informed buyer or seller, you’ll make the best decisions for the most important purchase or sale in your lifetime. That’s why my goal is to keep you informed on trends in the marketplace using the latest statistics in your local area. Real estate is more than financial! It comes down to having someone by your side who has in-depth knowledge of Santa Barbara and the surrounding communities so that she can help you weed out what doesn’t work for you and choose a place that meets your needs, your budget and your taste. Barbara Reaume is that person. 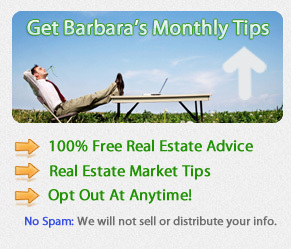 As a local real estate expert and a long-time resident of the area, Barbara knows the quirks of the Santa Barbara real estate market. “In the early 1980s I was in your shoes. I was searching for the perfect home for my family and myself but it seemed impossible. Sometimes I’d just want to give up in despair and it wasn’t because I lacked the resources. I KNEW the home I wanted was out there somewhere and I’d have given anything to find a Realtor who’d put in the time and effort and would look out for ME, someone to advise me on my options, and hold my hand through the process of buying a piece of real estate at a price that didn’t make me run for the hills. And in the end I wanted to trust my Realtor to negotiate a real estate contract that I could live with. “Well, it didn’t work out quite that way! 3 out of 4 Realtors upset or frustrated me and the last thing I wanted to do was to put my goal of finding my family’s perfect home in the hands of someone who behaved like a rank amateur and didn’t know their stuff. 26 years later Barbara Reaume is a successful Realtor for Coldwell Banker in Montecito, buying and selling Santa Barbara real estate, Montecito real estate, Carpinteria real estate, and Goleta real estate. She is a Graduate of the Real Estate Institute (GRI), a Certified Negotiator (CN), a Senior’s Real Estate Specialist (SRES) and experienced with 1031 exchanges. Information makes a difference. When you’re informed, you make better decisions. And who better to inform you than a Realtor who is rooted in the community, knows its resources and is up to date on current trends in this area? Whether your heart lies in Santa Barbara, Goleta, Montecito or Carpinteria, Barbara helps you make the best possible decisions about your purchase or sale. Yes, it’s YOUR money AND you must expect your Realtor to put your financial well-being first. Barbara’s many satisfied clients appreciate her uncompromising loyalty to their interests. Real estate is a sound investment for the future. Your big dreams and the details of your transaction take center stage as Barbara assists you in buying or selling Santa Barbara real estate. Seniors who want to downsize, move closer to the kids or are simply hankering for a change of scenery, face a specific set of issues. Barbara understands what you’re up against. With specialized training as a Seniors Real Estate Specialist (SRES®) she works with your advisors to make the best use of reverse mortgages, 401K accounts and IRAs in your real estate transactions. A home transition can create upheaval in your life and lifestyle. She understands that too. Talking to your local real estate expert will relieve your worries! Call Barbara today at (805) 610-4503 or email [email protected]. Bookmark this site and come back often – it’s your online source for information on Santa Barbara real estate, Montecito real estate, Carpinteria real estate, and Goleta real estate. You’ll also find information on real estate financing in Santa Barbara, Cliff Real Estate in Santa Barbara and of course the latest property listings. Barbara Reaume understands what you’re up against. As a Seniors Real Estate Specialist (SRES®) she works with your advisors to make the best use of reverse mortgages, 401K accounts and IRAs in your real estate transactions. A home transition can create upheaval in your life and lifestyle. She understands that too. More than financial! When you need someone with in-depth knowledge of the community and its resources to help you choose a place that meets your needs and taste, Barbara is the person to talk to. Talk to an expert today so that you can stop worrying! With 26 years experience as a REALTOR®, Barbara will let you know exactly what you can expect to get for your money. Friendly Service: You want a realtor who operates from abundance and will remain friendly and balanced throughout the process. Negotiation Tips: Over the past 26 years, Barbara has collected many tips which she will share with you, in regards to negotations with buyers. Fiduciary Duty: Barbara has built her career on Fiduciary Duty. A fiduciary duty is the highest standard of care at either equity or law. A fiduciary is expected to be extremely loyal to the person to whom he/she owes the duty: must not put his personal interests before the duty, and must not profit from his position as a fiduciary, unless the principal consents. The word itself comes originally from the Latin fides, meaning faith, and fiducia, trust.